Don't bet against Joey Chestnut... or Nathan's? Competitive eater Joey "Jaws" Chestnut will attempt to win his ninth straight mustard belt on July 4th. 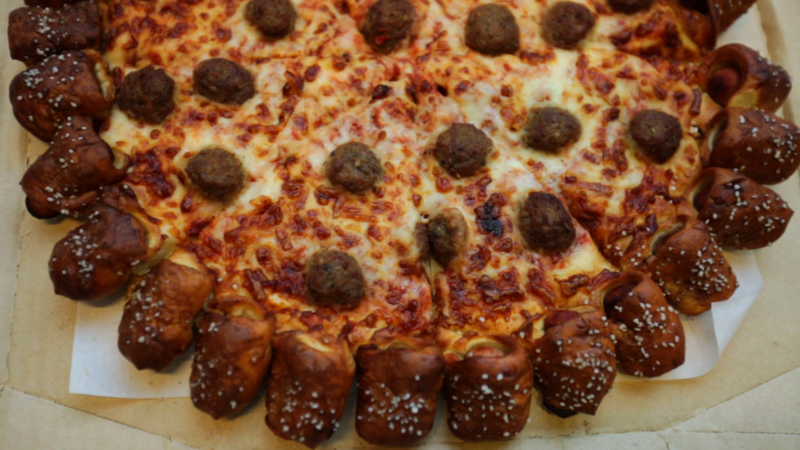 It's a disgusting display of gluttony. 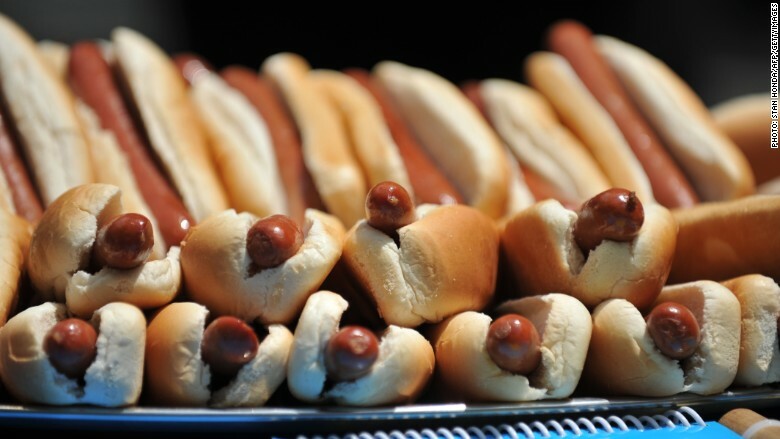 But for many, the annual hot dog eating contest is right up there with viewing fireworks as a holiday tradition. Nathan's Famous at Coney Island in Brooklyn has hosted this event since 1916. Next year will be the centennial! And it's becoming a tradition for me to write a story about this small restaurant company just before Independence Day. Related: Happy Birthday, U.S.A.! Have a hot dog. Or 70. Nathan's (NATH) went public in 1993. The company is only worth $170 million and trading volume is extremely low. About 42,000 shares change hands every day on average. Apple (AAPL), by way of comparison, has an average daily trading volume of nearly 45 million shares. But Nathan's has been a big wiener (sorry!) for the few long-term investors that own it. Its 5-year return of nearly 270% is much better than the S&P 500 -- as well as larger fast food chains McDonald's (MCD) and Yum! Brands (YUM). But Nathan's has fallen on hard times this year. The stock is down nearly 30% so far in 2015. That may seem odd given the frenzy for fast food on Wall Street. 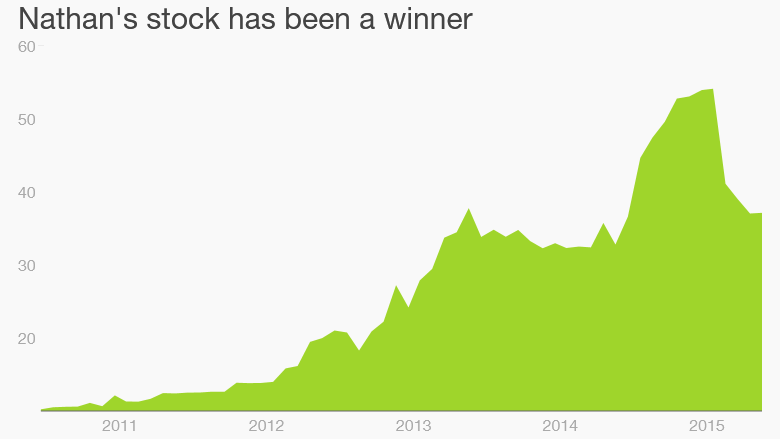 Shake Shack (SHAK) has been one of the top initial public offerings of the year. Chicken chain Wingstop (WING) has also done well. But Nathan's financials are healthy -- probably a lot healthier than the hot dogs and fries it serves. Sales were up 24% in its last fiscal year and profits rose more than 40%. Still, some on Wall Street may be nervous because the company just took on a lot of debt. It sold $135 million in junk bonds in February. Nathan's did that in order to pay a gargantuan one-time special dividend of $25 a share to its investors. This could be viewed as a sign that management is trying to reward shareholders now because they are worried about the future. But that reasoning seems odd. After all, it was only last year that Nathan's cleared up a nasty dispute with one of its long-term suppliers and signed a new contract with Smithfield Foods subsidiary John Morrell. That deal gives Nathan's higher royalty fees. Related: Are junk bonds the next financial crisis? Nathan's is still a risky stock though. Because the company is so small and has no Wall Street analysts covering it, it will probably continue to be very volatile. Investing in it could be as nauseating as experience as watching people stuff dozens of frankfurters into their mouths on ESPN on July 4th. Then again, the stock has been as dependable as Chestnut for the past few years. So betting against Nathan's ... or Jaws ... could be a mistake.